The log home made of freshly peeled white spruce sitting on the side of the road about two miles north of Nenana could be the first of many. At least, that’s what the Toghotthele Corporation is hoping. “We’ve already had four people pull into the driveway and say, ‘Is this for sale?’ We have interest just from passers-by seeing the activity going on. If these guys are interested in it, we could sell them a kit,” said Jim Sackett, CEO of the Nenana-based corporation. Earlier, a group of students placed the tie log for a roof truss. 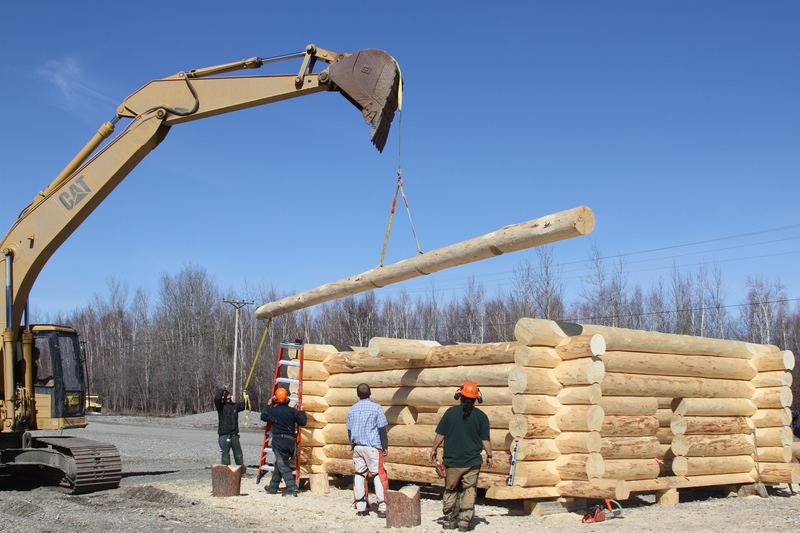 This included scribing the logs (or tracing the shape of one log onto the other), cutting the notches, and using an excavator to lift and position the tie log on top of the side walls. 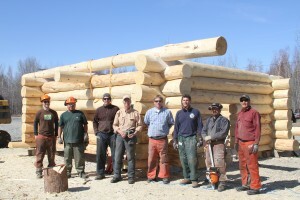 The 16-by-20-foot full scribe log home is the product of a three-week construction workshop that wrapped up earlier this month offered by Toghotthele and the University of Alaska Fairbanks Cooperative Extensive Service. It was taught by Robert Chambers, who teaches log building around the world, and local log builder Rich Musick. The students are Toghotthele shareholders, plus a contractor from California who flew up specifically to take the class. 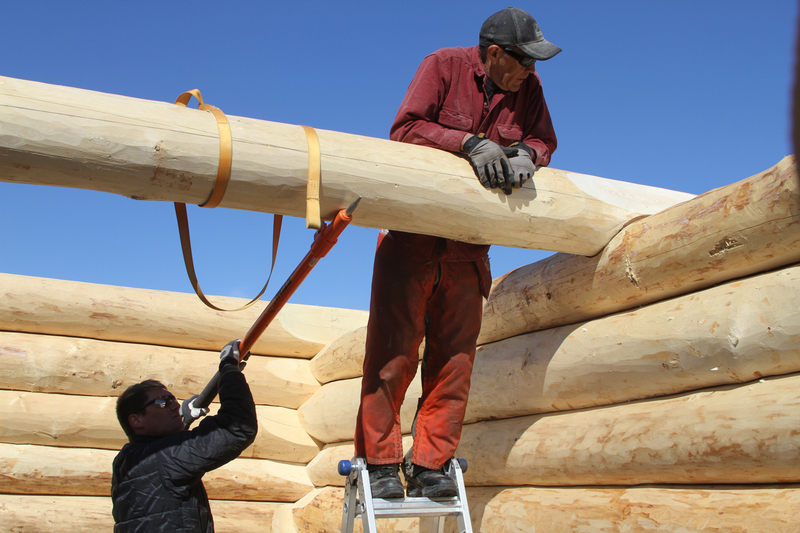 They’re learning the craft not only to build log homes of their own, but also to possibly start a new business in Nenana that uses local resources and provides new housing. Sackett is anticipating a potential housing boom if oil is found during exploratory drilling in the Nenana Basin this summer. Toghotthele owns roughly 140,000 acres of white spruce and is developing two subdivisions for construction. 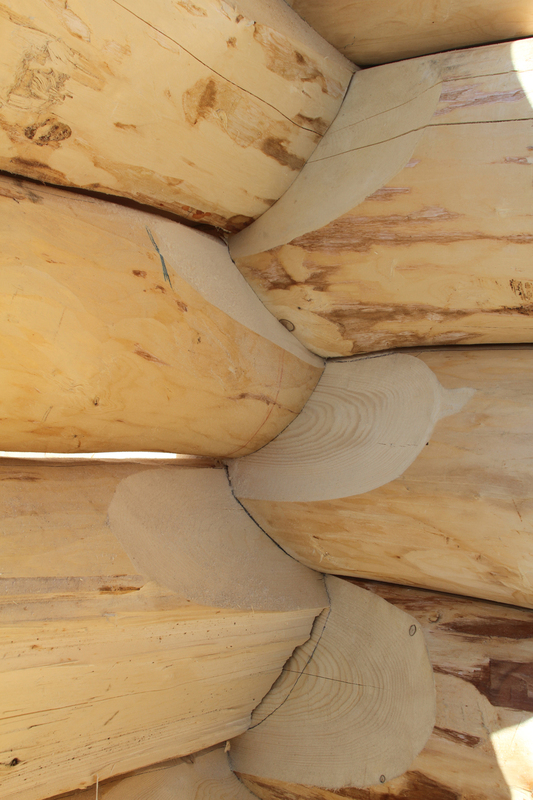 Full scribe construction means the logs retain their natural shapes and irregular surfaces. They are precisely hand-fitted to each other with no gaps, nails or other hardware. 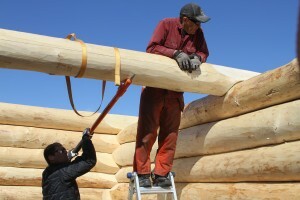 The method Chambers is teaching allows for logs to shrink as they dry (which typically takes up to six years) to ultimately form an airtight joint. During the course, students practiced techniques familiar to log construction including scribing, notching, using chain saws and hand tools for sculpting and fitting, and other tools like spuds (for removing bark) and plumb bobs and levels (to orient layout lines and logs in horizontal and vertical directions relative to one another). In today’s trend toward super-insulated homes, there is debate about how much insulation is enough. 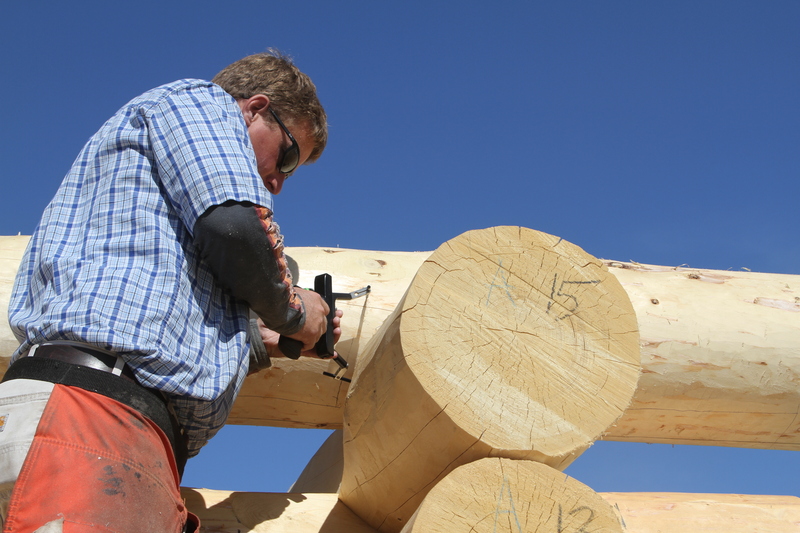 When it comes to logs, the R-value of wood is lower than other insulating materials. Wood is about R-1 per inch, compared to fiberglass (R-3.2 per inch) or rigid foam (R-4-5 per inch). So in theory, it would take a 16-inch log to achieve the same R-value as a standard 2×6 wall filled with fiberglass (if you don’t count extra heat loss through the studs). “By the numbers, you’d be really hard-pressed to find Interior Alaska logs big enough to perform above R-21. But it’s a matter of perspective. You can build a decent wall system, and by making improvements to the rest of the shell — putting in an efficient heating system, good windows, good foundation and roof insulation — you can do really well,” said Ilya Benesch, building educator at the Cold Climate Housing Research Center. As Chambers puts it, the embodied energy of building with local logs (the total energy used to produce all the building materials) beats most other construction methods. “Homes that have a lot of concrete, aluminum and glued manufactured wooden products have a very high embodied energy,” he said. In addition, well-built log homes can last 1,000 years, making them even more sustainable, he said. You also can build very tight homes using full-scribe construction. Chambers seals the space between logs with a double gasket made from open-cell foam that is compressible but acts as an air and vapor barrier. He noted a log home in Soldotna that tested at 0.5 air changes per hour, which rivals some of the tightest homes out there. Chinking with elastic caulking is another way to air-seal joints between logs, though alters the appearance of the otherwise natural fit. As Sackett points out, some Alaskans just prefer log. “Log is just natural to Alaska. A lot of the early homes were log, and people just have this attraction to log homes,” he said. Check out Chambers’ DVD and book series here. 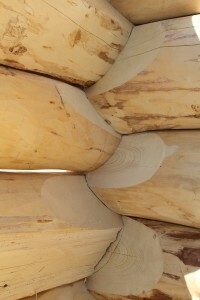 Green logs take 4-6 years to settle and form an air-tight seal. Placing the cap log on the cabin. Scribing, which means tracing the shape of one log onto the other for a perfect fit. 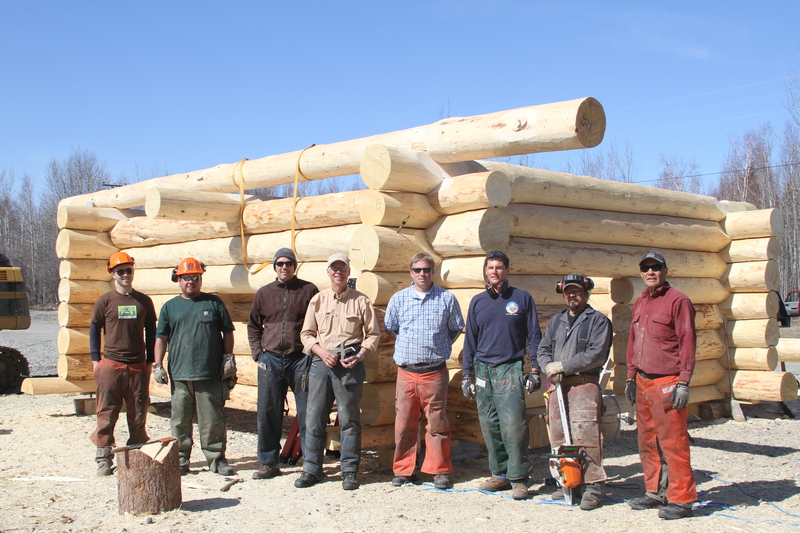 Posted in Ask A Builder, Uncategorized and tagged alaska, cold climate housing research center, fairbanks, full scribe, log building, log cabin, log construction, nenana, rich musick, robert chambers on May 31, 2013 by mrettig. What are Vacuum Insulated Panels?